For years, the Coen brothers have had an ideal set-up. They make modestly budgeted films so that expectations for financial returns are not very high. This is turn allows them a considerable amount of creative freedom. Thanks to their reputation for making highly-regarded films that are distinctly their own, the Coens have no problem attracting quality actors more than willing to work for less than their usual salary just to be in one of their films. Never easy filmmakers to pin down, they constantly defy expectations as to what film will follow their last. For example, who would’ve imagined that they would follow the Academy Award-winning crime film Fargo (1996) with the cult film comedy The Big Lebowski (1998)? 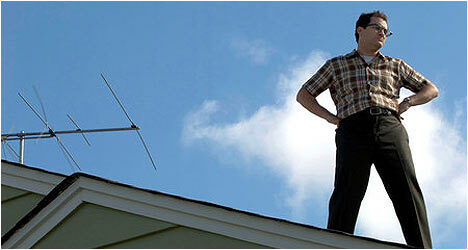 They’ve done it again with A Serious Man (2009). Prior to this latest film, they made Burn After Reading (2008), a movie star-studded farce set in Washington, D.C. For their new film, they’ve returned back to their roots with a darkly comic story set in their hometown of Minneapolis starring a cast of relative unknowns. It’s 1967 and Larry Gopnik (Stuhlbarg) is a physics professor leading a fairly normal life. He has a good job and a family but this all starts to unravel when his wife (Lennick) tells him that she wants a divorce as she’s in love with one of his fellow teachers (Melamed). One of his students, in danger of losing his scholarship, tries to bribe Larry. He attempts to continue on with his daily routine the best that he can but soon finds that his chances of getting tenure at work are in danger from mysterious sources. Larry’s gruff next-door neighbour plans to build a boat shed that encroaches on his property. Larry comes across as an incredible doormat willing to take an unbelievable amount of grief from everyone: his wife, his boss and the father of the student who tried to bribe him. He doesn’t understand why it seems like everyone is against him and looks to his faith for answers. So, he visits three different rabbis. The first of which is too young and inexperienced to really help. The second one tells him a story which has no apparent bearing on Larry’s situation. The third one doesn’t even have the time to see him. What does this mean and what should Larry do? A Serious Man is one long slow burn as Larry’s life gradually falls apart but all done in the Coen brothers’ trademark dry, deadpan humour. In many respects, it is their cinematic rebuttal to their two chief critics: J. Hoberman and Jonathan Rosenbaum who claim that several of their films are anti-Semitic in nature (i.e. the killing of the Jewish gangster in Miller’s Crossing and the unpleasant nature of the Jewish protagonist in Barton Fink). To counter, or rather poke fun of these criticisms, the Coens created a defiantly proud of his Jewish faith Vietnam war veteran in The Big Lebowski. With A Serious Man, they have created a film that is set in a world almost entirely populated by Jews. Their film asks some serious questions about what it means to be Jewish and one man’s place in the universe that is indifferent to his problems. “Becoming Serious” is a standard featurette that is fairly informative as several cast members briefly talk about what they believe the film is about. According to the Coens, several of the characters are based on people they knew growing up. “Creating 1967” takes a look at how the filmmakers captured the look of the late 1960s. The production designer did a lot of research on Judaism to make sure that the faith was authentically represented. “Hebrew and Yiddish for Goys” gives a run down of what several key Jewish terms and words mean. This featurette acts as a good primer for the uninitiated.